A new exclusive Bitter Winter video documents the grim reality of the Yingye’er transformation through education camp for Muslim Uyghurs: not a “vocational training center” but a jail by any other name. 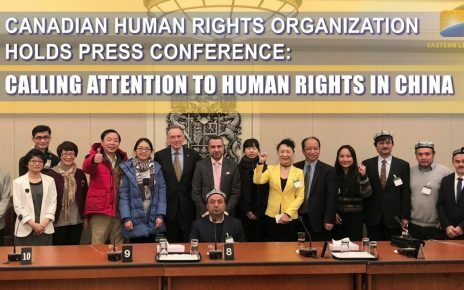 On November 12, one of Bitter Winter reporters published exclusive images of one of the transformation through education camps where one and a half million prisoners of conscience are held in China, one million of them Uyghur Muslims. 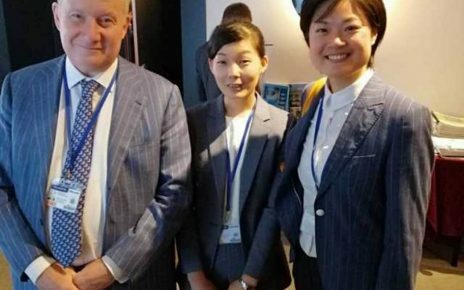 Now another reporter, whose anonymity should be protected, has sent to us images of another transformation through education camp in Xinjiang, with an internal structure identical to that of a prison. Recently, facing the international community’s constant denunciation and condemnation of Xinjiang’s transformation through education camps, the Chinese Communist Party (CCP) authorities have switched from denying the camps’ existence to claiming that they are “vocational training centers.” Our footage prove that the camps are indeed jails by any other name, where inmates are subject to severe indoctrinations. There are also credible reports that some are tortured and die there. The new video, just as the one published on November 12, comes from the Yining area in Xinjiang. 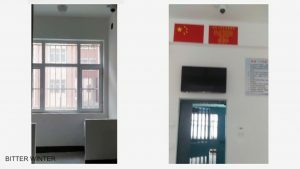 There is more than one camp in Yining, In August, our reporter penetrated the transformation through education camp in Yingye’er township, and photographed its interior constructions. Internal view of the dormitory building in the transformation through education camp, where every room is fitted with double iron doors, just like a prison. 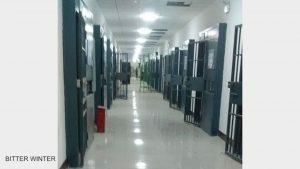 Inside the buildings, the interior constructions are just like the cells of a prison or detention center. Each room has double iron doors, and the outermost iron door also has guard railing and a keypad lock. Each ‘dorm room’ has its own washroom, and is fitted with a surveillance camera. According to a leak from an inside source, up to 15 people can live in each dorm. Surveying has also revealed that each floor holds 28 dorm rooms and 3 classrooms. Various slogans are written on the walls outside of the classrooms, such as: “Make a habit of studying Mandarin” (intended for Uyghurs, who normally do not speak Mandarin but only their own Uyghur language) and “Follow the guidance of Xi Jinping’s thought on socialism with Chinese characteristics for a new era, and untiringly strive to achieve the dream of the people of China to bring about a great rejuvenation of the Chinese nation.” In the classrooms, railing and separation nets separate the teachers’ lecterns from the students’ desks. Surveillance cameras are installed inside and outside the room. Besides, this floor of the building also contains a standalone surveillance room. 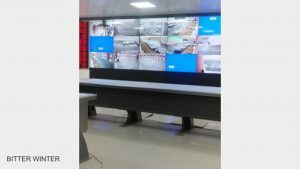 From the large-screen monitor, it is apparent that 360-degree surveillance cameras are installed in every corner of the building—including not only classrooms, dormitories and corridors, but even washrooms. Every move by the detainees is monitored, 24 hours a day. They are totally deprived of freedom and privacy. The entirety of each building is stringently guarded. In addition to surveillance cameras being installed in every corner, the entrance to the building has been fitted with an iron gate. In the corridors, the windows of each room have also been sealed with tight iron bars and wire netting. Even the windows in the room that may be used as the “student” cafeteria are no exception. It is nearly impossible for the inmates to escape. Our reporter also noticed that there are several areas surrounded by chain-link fencing on empty land in front of certain buildings, next to which large quantities of wire netting that hasn’t yet been used is stacked in piles. On one side of the fencing the words “emergency asylum” are written. According to an inside source from the public security system, this “emergency asylum” is most likely an outside walking area for detainees. An outside walking area is a place in the courtyard of a prison where the prison allows its inmates to go to get some exercise at set times. Three surveillance cameras are installed at the exit areas of each building, and all the windows are sealed off with barbed wire and iron bars. 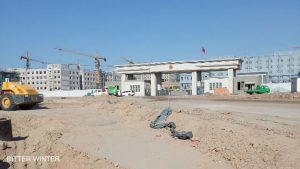 The Yingye’er transformation through education camp has been advertised to the outside world as a vocational training school — though there is no difference between its inner constructions and those of a prison. But now the truth is emerging. 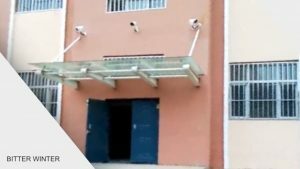 Bitter Winter videos, that our reporters shoot by exposing themselves to very serious risks, prove that the transformation through education camps are jails, not vocational center or schools.